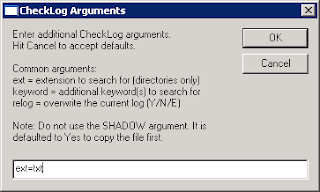 Open the file and replace the value of the variable CheckLog with the location of the CheckLog SAS macro. Change the extension of the file to "vbs". Note: VBScript is required, which is unfortunately only available on Microsoft Windows. I hope to develop a platform-independent script sometime. I chose VBScript because it required no additional installation or administrator requirements on the platform I current work on. This script should save me a lot of time! Normally I would copy the directory and filename of the log into a SAS session and paste it into a CheckLog call. But now it's more automatic, and I get the results faster. Please feel free to send me feedback about the script!